There are many types of Fire Suppression Systems which means that there are various regulations to follow. We offer all services, from design, installations, repairs and semiannual service, complies with the State Fire Marshal requirements, State of California Codes, and the National Fire Protection Association. Kitchen Suppression Systems: We design, install, repair, and service all type of fire suppression systems with the UL 300 standard which requires an accurate amount of wet chemical agent to be applied to cooking appliances according to the manufacturer specifications. 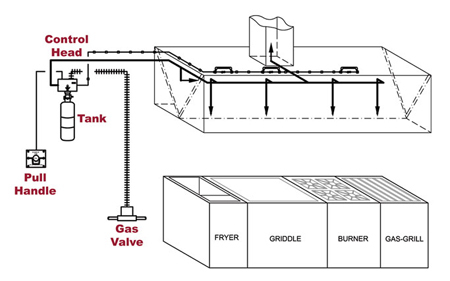 The fire suppression system incorporates a flexible design with and extremely effective Low pH Liquid Agent. The wet chemical agent quickly knocks down flames and cools hot surfaces, while generating a tough vapor securing blanket that helps prevent re-flush. 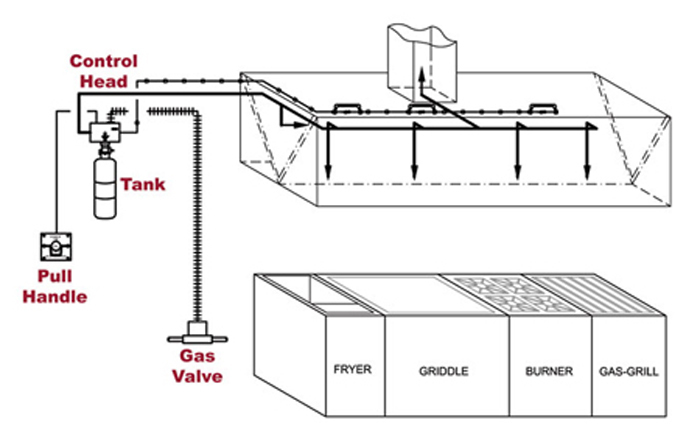 All kitchen fire suppression systems designed to protect areas associated with ventilating equipment, including hoods, ducts, plenums, and filters. It also protects auxiliary grease extraction equipment and cooking equipment such as various types of fryers, griddles, range tops broilers, char-broilers and woks. We at Regency service the Los Angeles metro and install all type of commercial kitchens fire suppression systems from small restaurants to large hotels, hospitals and mobile food trucks.